The domain within your query sequence starts at position 4454 and ends at position 4570; the E-value for the HEPN domain shown below is 9.49e-24. 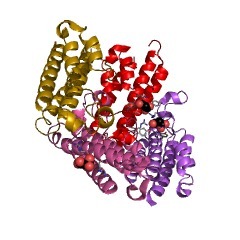 Single-domain HEPN proteins found in many bacteria. 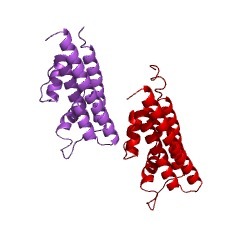 Two-domain proteins with N-terminal nucleotidyltransferase (NT) and C- terminal HEPN domains. This N-terminal NT domain belongs to a large family of NTs, which includes several classes of enzymes that are responsible for some types of bacterial resistance to aminoglycosides. 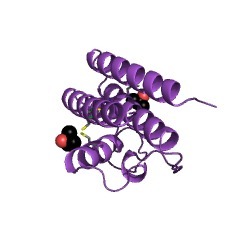 These enzymes deactivate various antibiotics by transferring a nucleotidyl group to the drug. A multidomain sacsin protein in genomes of fish and mammals. 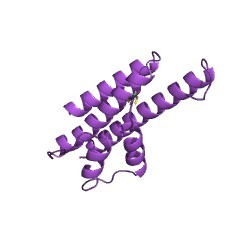 The HEPN domain is located at the C terminus of the protein, directly after the DnaJ domain (IPR001623). 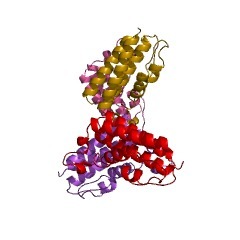 The crystal structure of the HEPN domain from the TM0613 protein of Thermotoga maritima indicates that it is structurally similar to the C-terminal all- alpha-helical domain of kanamycin nucleotidyltransferases (KNTases). It is composed of five alpha helices, three of which form an up- and-down helical bundle, with a pair of short helices on the side. The distant structural similarity suggests that the HEPN domain might be involved in nucleotide binding [(PUBMED:12765831)]. There are 2378 HEPN domains in 2378 proteins in SMART's nrdb database. Taxonomic distribution of proteins containing HEPN domain. This tree includes only several representative species. The complete taxonomic breakdown of all proteins with HEPN domain is also avaliable. Click on the protein counts, or double click on taxonomic names to display all proteins containing HEPN domain in the selected taxonomic class. This information is based on mapping of SMART genomic protein database to KEGG orthologous groups. Percentage points are related to the number of proteins with HEPN domain which could be assigned to a KEGG orthologous group, and not all proteins containing HEPN domain. Please note that proteins can be included in multiple pathways, ie. the numbers above will not always add up to 100%.